Assorted Notions: Ahoy! Ship to set sail soon. Ahoy! Ship to set sail soon. 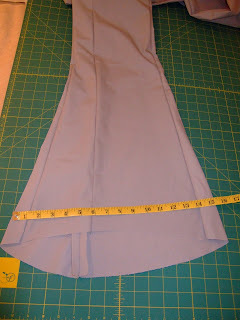 I finally finished up my Ahoy There sailor pants muslin using a custom size pattern from printsew.com. I was happily surprised when the pants fit quite nicely! (Marie Claude had the same nice fit with her custom Ahoy pattern, too.) At least nice enough for me to feel comfortable purchasing 3 yards of navy linen fabric this week, something with a bit of stretch, as the thighs & hips fit just snug enough to want that 5-10% leeway. 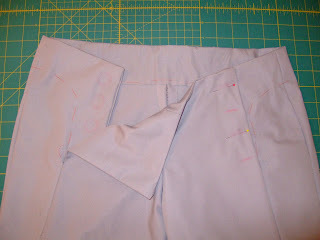 can't wait to see how these turn out.They look gorgeous in the pattern picture and I'm dying for a pair of trousers like this!So looking forward to seeing your fo!.Just found your blog and am enjoying it , you're a sewing inspiration! Thanks, eithne! And I plan to post more info on the construction details later.